SDS-PAGE Analysis of Purified, BSA-Free CD11b Antibody (clone M1/70). 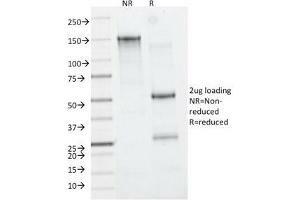 Confirmation of Integrity and Purity of the Antibody. Immunogen B10 mouse spleen cells enriched for T lymphocytes were used as the immunogen for this CD11b antibody. Background CD11b is a cell adhesion molecule that acts as a receptor for cell surface ligands such as intracellular adhesion molecules (ICAMs) or soluble ligands. Integrins are heterodimeric proteins that contain an a chain and b chain. Integrin alpha-M (CD11b) combines with the Integrin beta-2 (CD18) to form a leukocyte-specific integrin referred to as macrophage receptor 1 (Mac-1), or inactivated-C3b (iC3b) receptor 3 (CR3). Integrin alpha-M/beta-2 is important in the adherence of neutrophils and monocytes to stimulated endothelium, and also in the phagocytosis of complement coated particles. Storage Comment Store the CD11b antibody at 2-8°C (with azide) or aliquot and store at -20°C or colder (without azide).